Why do I start my refit program for the whole interior with the fore cabin? Well, maybe because it´s a logical decision to begin with the foremost cabin, maybe it´s because this is a more private place onboard and I just want to check my own abilities as designer, refurbisher and boat builder before I work on the more representative cabins just as the saloon. 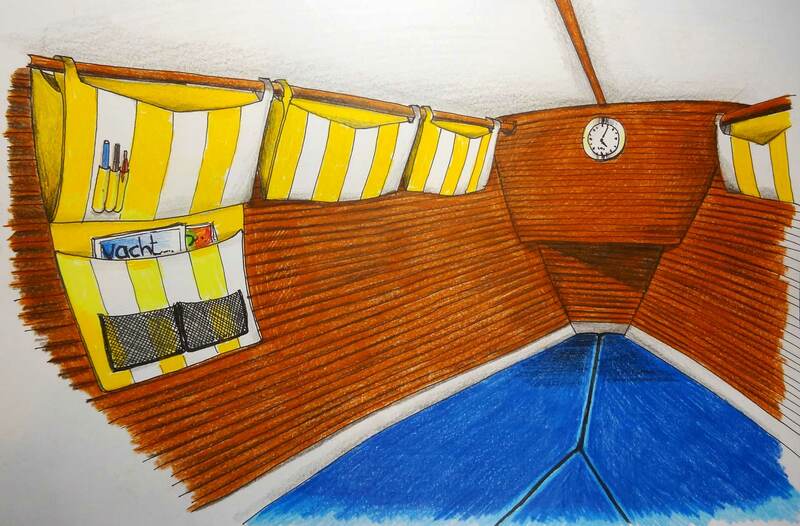 Nevertheless, the fore cabin (or forecastle cabin) is a very important space onboard a yacht. Why? Mostly, as far as I know, it´s the family´s cabin. Mothers and kids have their preferred place here – especially on smaller sized yachts such as mine. Here you´ll find the drying locker for your sailing gear and on older boats the lavatory as well. My son loves the forecastle: He will fall asleep instantly – it´s the one place onboard a ship that is moving the most. Swell makes children sleep. So, if mom and your kids won´t like it here, it´s unlikely they will love the whole sailing-thingy. Time to invest a lot of effort into refurbishing the forecastle in the best possible way. I have visited a number of forecastles, for example on the Hanseboot-fair in Hamburg (you may read the full article here) or during my visit on the dream yachts Hallberg-Rassy 412 and HR 43 (read full article here) to get a feeling what a modern fore cabin is all about. And of course to draw some inspiration for solutions to apply on my forecastle in my King´s Cruiser 33. What strikes me most about modern day yacht cabin-design: The rooms are bright, as much light as possible, a lot of portholes and hatches. And space. Much space. 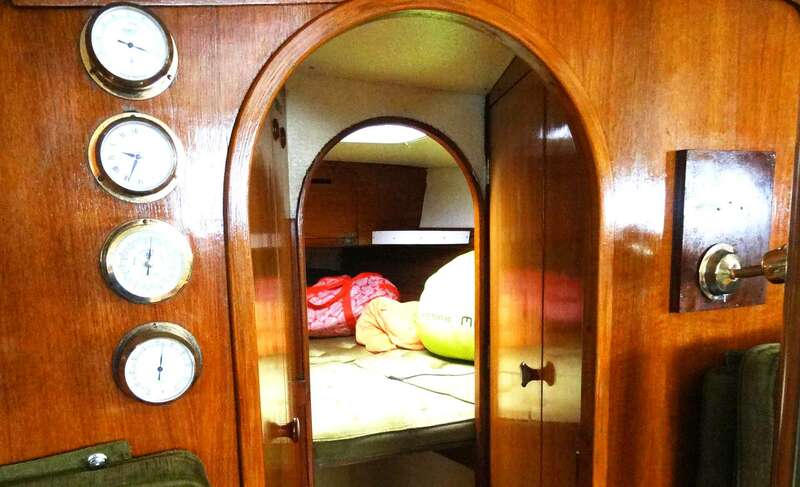 Past days: A look into the forecastle of my King´s Cruiser 33. It´s a long time since the forecastle has been a dark wet hole, a place where swell was making people sick, a cramped cave where the seasick used to hide themselves. More so, it´s nowadays a place for recreation and recreation. Here you may rest, lay down. Maybe open a hatch above your head and comtemplate the rigging, you may have a long look onto the surface of the water. Modern day fore cabins are of similar size as the big owner-cabins in the aft. Are an expression of luxury and extent. It´s a pity that my own boat – 33 feet in length – is a „classic“ construction. Or to call it: An old IOR-boat with classic cruiser-lines. That means: Not very spacious compared to modern yachts. 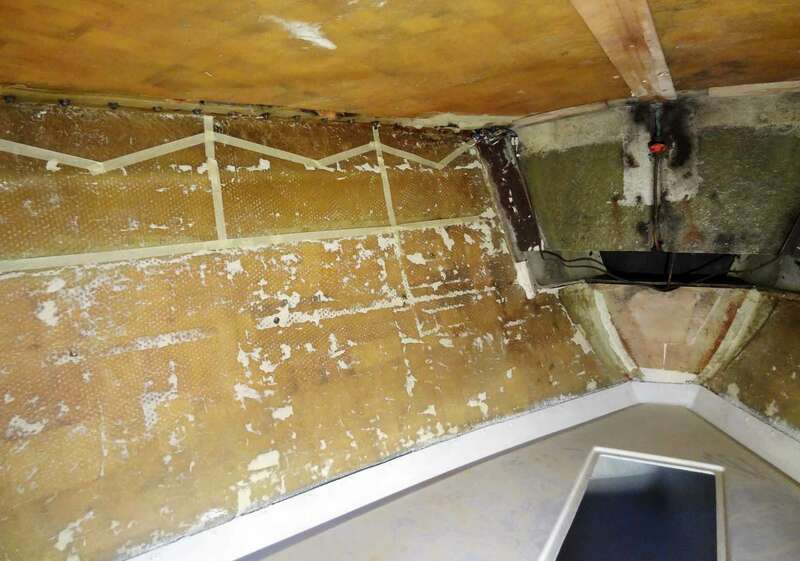 But that fact makes it just more important to deliver a great job when refitting this cabin. Here are my thoughts on what I´d like to do with my forecastle. I do want my wife and my children to feel comfortable here. That´s the overall aim. I want my kids to go to sleep in the forecastle with good grace, want them to feel at home and comfy here. I want to squeeze out every possible inch of space, want to make it light and roomy, use every corner to create a positive atmosphere here. Of great importance is stowage as well: Clothing, stuff of daily importance such as socks, underwear or diapers to have them in fast reach. But also accessories such as books and magazines should get their practical yet cluttered space. That’s why a clever concept of lighting is of utter importance as well. Due to the fact that here my kids will find their good night´s sleep I want this cabin to be safe in terms of swell and ship´s movements. That is a lot of stuff to think about and a load of work ahead indeed – but this first real cabin onboard my own boat to be refitted will not only create a lot of working time but also fun and opportunities to learn. Compared to modern vessels of the same 33-feet length my boat is rather poky. But when I roam about onboard other 33-feet yachts of similar age I think a King´s Cruiser 33 is more spacious. Somehow Pelle Petterson, the designer of my boat, made a good job more than 40 years ago. The fore cabin of a King´s Cruiser 33 measures 2.10 meters (7 feet) in length, has a maximum width of again some 2.20 meters and is 90 centimeters (2 feet) high. The forepeak hosting anchors, chain, other stuff and the two gas-containers has been made smaller by my pre-owners, creating some 20 centimeters more space for the cabin. Above our heads we find a standard hatch, when open it is giving way and free sight to the mast and a blue sky. We have a lot of resting space here, the whole cabin is one big cosy bed. However the dark varnished wooden paneling and especially the dark-green cushion do darken the whole cabin. Additionally all the cupboards and the floppy mounted racks do cramp the whole place furthermore. I remove everything and dispose of. I will start from scratch. The fore cabin now: Scrapped down to the bare GRP and ready to redefined. After removing everything from the fore cabin I do dismount the wooden panels and get rid of the leather-coatings. Ceiling panels removed as well as all the lights – two of which have been installed by the wharf two more ugly lights by the pre-owners. Step two is grinding the GRP surface and stowage to ready them for the new paint. After pre-coating all GRP-surfaces I do paint them with two layers in a new shiny yacht-white – inside the three large stowage-containers underneath the cushion as well – and complete the first step. Normally we lay down head pointing aft which is against the plan of the designers of my boat. That’s why we sleep with a slight downward slope which will have to be balanced by the new cushion in the future. To date the cabin has been fitted with two lights mounted at the bulkhead and two more lights overhead in the aft-corners of the cabin. I will change that drastically. My plan: Two separately controllable LED-lights to be mounted in the ceiling at two thirds of the cabin aft should secure the general lighting situation in the cabin. An additional reading lamp – similar to the navigation light – mounted on a flexible extension will be installed on the port-side of the cabin since both my wife and myself prefer to sleep on the left sides of a bed. I assume the fore cabin is the place where my kids will be sleeping mostly. So mounting an effective rolling-protection is essential. I want to solve that problem in two ways: One is an additional triangular cushion of some 20 centimeters in height to be inserted in the middle of the bed, two is a strong net to hang down from the ceiling to prevent the kids from free-rolling while asleep. It´s also of utter importance to me to have a clock in sight so the forward bulkhead to the forepeak will be outfitted with one which will also enrich this otherwise empty wooden panel with a visual focus point of the whole cabin. Most fore cabins I was able to glance at have been outfitted with massive cupboards made of wood. These do not only look “shiplike” but they do offer a lot of space. On the other hand they do occupy a lot of room – room I do not have in my own boat. So that´s not an alternative for me. I also do not like the simple cupboards which are mounted as standard equipment for the King´s Cruiser 33. They are simply too slim and do bring more derangement than order to the stuff stored here. Into the bargain the pre-owners did mount some additional smaller cupboards into the corners of the cabin, very floppy made. No, no, I´ll go for something completely different here. Simple custom-made pockets made of strong denim. Some models made with paper to determine the best pattern for sewing. These pockets – just as bird´s nests – will be compartmented to three or four on each side of the cabin and will offer a lot of stowage by not occupying too much space of the cabin at the same time. That´s more than enough space for stowing away all the stiff like t-shirts, underwear, sleeping cloth, diapers and my wife´s creams. The construction is utterly simple: A spar made of wood is mounted all the length from bow to the bulkhead just underneath the ceiling of the cabin some 25 centimeters into the cabin. The pockets will have two loops each to span them onto the spar and fix them to the vessel´s side either by hanging lugs into the wooden panels or by attaching some kind of other fixation. To have a bit of visual variety here I have decided to opt for two or three closed pockets and one pocket made of a net to see-thorugh what´s inside (pair of socks for example). The denim-nests will be some 5 to 8 centimeters deep, 28 centimeters high and 40 centimeters wide. That´s more than enough stowage knowing that there are three very big stowage chambers just beneath the cushion. Taking measurements inside the fore cabin with tape. What I am asking myself right now is what form the pockets should have – closed with a lid, open with a round, triangular or straight fly? Should it be lockable with Velcro-fastener, knobs or a simple slipknot? To be sure I built a model in 1:2 scale of the pockets in 3 of the variants – just to be sure for myself, to have an opportunity to speak about all this with my wife and to further perfect the construction since it all will have to be made custom. In addition we will outfit the very first pocket on the port-side with pencil-holders and a net to stow away a magazine or two or a book to prevent this stuff from flying around in the cabin. Isn´t that quite a nice idea combined with a simple and yet solid implementation? 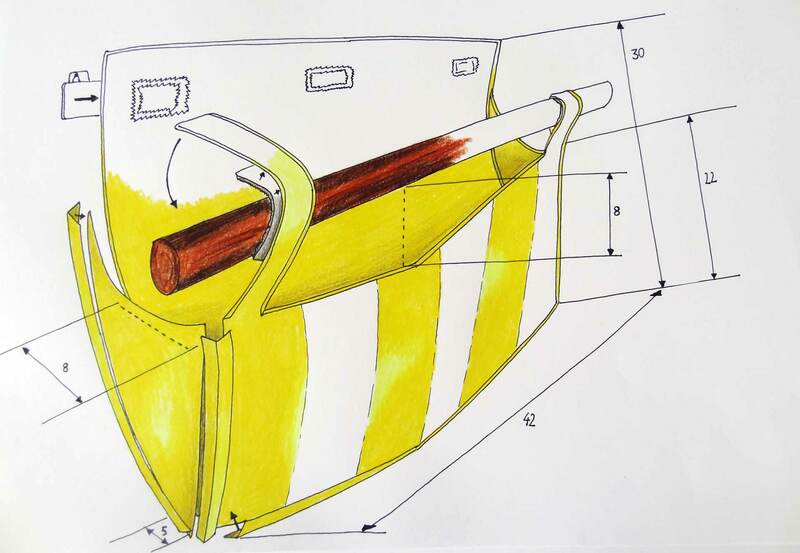 For our SY OLIVIA we already have chosen to go for a classic design of everything we do and renew during the course of the interior refit-program. We want to keep the rather dark tones of the wooden surfaces but will therefore lighten up a bit the overall appearance by the ship by going for a slightly lighter color of the decking and above all a classic shiny yacht-white for all GRP surfaces as well. The same is meant for the renewed ceiling which will come in with a creamy white leather. Concerning the cushion we opted for a full tone blue – although we don´t know yet which color exactly and which fabric to choose. The finished sketch of the upcoming stowage bags made of denim. An upcoming article will deal with that question when I visit a yacht specialized upholsterer. Nevertheless, the denim of the pockets we are discussing here should match both color and haptic of the upholstery. Maybe we will realize to use the white-blue-striped fabric we once planned to utilize for the whole upholstery. This also could be the scheme for the pillows and stuff in the saloon. Anyway, whatever we decide, these decisions will determine the look of the whole ships interior as well. You can be sure, once we opt for a denim or color we´d have to use it all along the ship from forecastle to saloon and back aft to the quarter berth. That´s really an exciting moment for me as well as for OLIVIA. Or. Maybe. 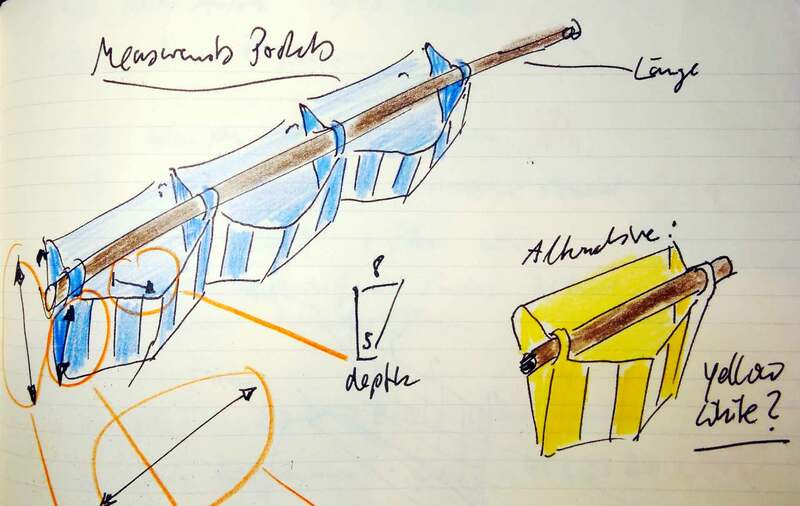 Should we go for a white-yellow striped scheme …? Next steps: Taking Measurements and trying out some models. For sure I won´t be able to turn all the ideas sketched here into reality in one single huge effort. Before I can go for these rather cosmetic milestones there´s a refit of the whole electrical system and a review of all circuits in queue – which means also wires and lighting for the fore cabin. 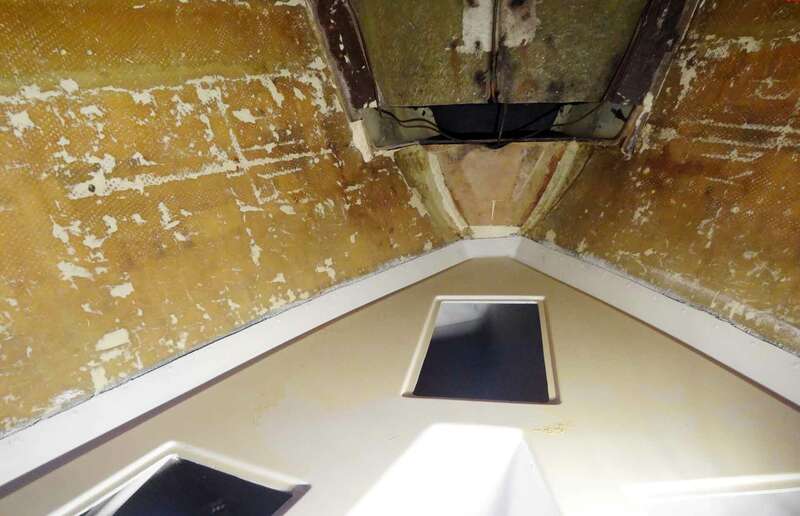 I have already started to refurbish the forecastle in grinding down and varnishing the GRP surfaces so that there´s a solid base for the next steps like the ceiling panels (which will host the lights) and the new fairing for the ships side with damping and wooden panels. Surely that will last well into coming spring season. Since I do not really need to come around with the perfect idea right now I will surely take some more time to think about the fabric, the colors and the pattern for sewing by trying out some more models made of cardboard and searching for inspiration. That´s how it is supposed to look like in a few months. I am looking forward to that process very much. At the same time, grinding and varnishing inside my yacht will proceed. Which yacht cabin is the most important in your eyes and what do you think of my plans for the fore cabin of SY OLIVIA? Looking forward to receiving your comments & useful hints.